We started my husband’s birthday weekend off by enjoying a date night. I heard from friends that The Station was really yummy, and then I read an article about it in Sunset Magazine and I was sold! The Station boasts a huge wood-fired pizza oven, a fantastic menu, local brews on tap and great atmosphere with a super friendly staff. The restaurant was packed so we had a beer on the adorable patio while we waited. Christmas lights and cool, brisk autumn air are essential for a good date night in October. While snuggling on the patio, we got a really good look at the menu and although there were not many vegetarian options (I’m a pescatarian, have been for 12 years), I had my eye on a pizza called Boss Lady and intended to order it without chicken. It has Maytag blue cheese, basil chiffonade, fresh eight vegetable medley, and Serrano pepper…hello there, Boss Lady, yes please. Allow me to digress for a moment and share my disappointment about NOT trying the Boss Lady pizza. It is so popular that they ran out of vegetable medley! I was so sad. I asked the waiter if it would be worth it without it and he said no way, so I’ll just have to go back and try it another time. *Sigh* Okay, so my back up order was the classic Margherita Fresca, always a good choice. My hubby had the Albatross, pictured below, which has house-smoked pork belly, Serrano pepper, grana, and a sunny-side up egg. He was over the moon with his selection, and I enjoyed the freshness of the ingredients and the fantastic crust. It was hand tossed and perfectly crispy, not overly seasoned . On to drinks! My first beer, not pictured, was a Fort George Sunrise Oatmeal Pale Ale and my hubby tried the Triple Horn Irish Red. Both were delish and we would definitely order them again. For dessert they had a pretty tempting menu, cannoli, panna cotta, fresh baked cookies, gelato…aye yi yi! After pizza and beer, we had to go a little on the lighter side, so we went with gelato. We tried 3 flavors, lemon, chocolate peanut butter and spicy chocolate. The clear winner was chocolate peanut butter because of the ridiculously gigantic peanut butter chunks. It was a great meal and a great time with my hubby. 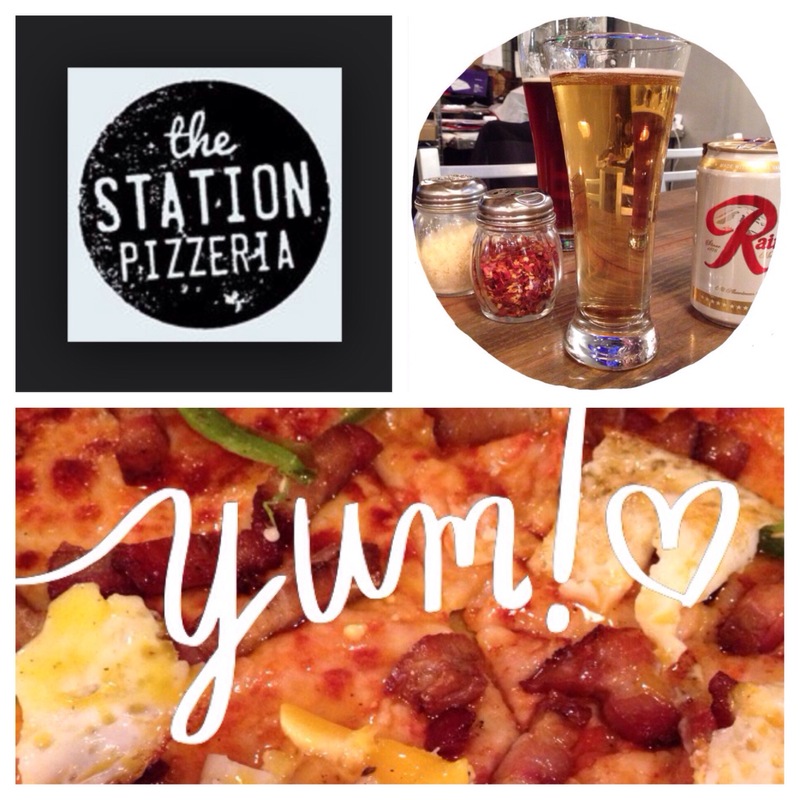 If you’re in Woodinville, taste some beer and/or wine, and stop by The Station for some seriously good pizza. I can’t wait to go back and try more items off the menu!